If you’re interested in outdoor work, love the idea of being in control of something important, and are a-okay with long, demanding hours for the satisfaction of project completion, then becoming a heavy equipment operator might just be a career in your wheelhouse. If you’re in the process of considering a career that’s punctuated by cranes, bulldozers, excavators, forklifts, moving parts designed to transport materials and more, then a heavy machine operator could be the perfect fit. This job is characterized by long days and tough hours, lots of outdoor work (typically) and often part time work, although full-time is certainly available if you look hard enough. If you’re hoping to build a skills-heavy career in a booming industry, this might be the perfect place to start. Being a heavy equipment operator offers you a certified pathway toward employment, higher wages, a flexible career, and opportunities that previously might have felt unavailable to you. Are you the type of person who rejects the typical 9-5? Are you looking for good pay, a great job outlook, and high satisfaction? Heavy equipment operators have access to all of that and more, depending on the state they work in the, the jurisdiction of the establishment they plan to work, and other factors. If you’re curious about the detail of this position, want to know the process of becoming an operator, or want to know more employment requirements, keep reading! We’ve got all the answers you’re looking for. Read on to learn about becoming a heavy equipment operator. 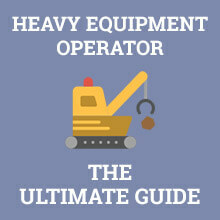 What Does a Heavy Machine Operator Do? If you’re mostly just asking yourself “what does a heavy machine operator even do?” then you’ve come to he right place. You’d likely see a heavy equipment operator on the side of the road, at a construction site, on farms, or building up or tearing down structures and other obstructions. A heavy machine operator is the person who is in charge of paving, surfacing, pile driving, moving materials, forklift operating, and other related tasks. Heavy machine operators are required to operate these machines in order to complete a specific task, care for these machines, and often repair and maintain these machines as well. Heavy machine operators are also required to keep themselves, the machine, and other working on the project safe around these heavy machines, so they’re required to abide by strict guidelines and procedures in order to accomplish this. The key responsibilities of heavy equipment operators at work is to control and operate the various machines that move earth, freight, or other materials, and operate construction equipment according to safety standards. Heavy equipment operators typically prepare sites for construction or maintenance, using machinery. As defined by the International Union of Operating Engineers can include things like compressors, cranes, dredges, drills, hoists, pumps, and rollers. You will be expected to inspect, clean, lubricate, and refill equipment. Even more, you’ll be expected to do all of these tasks under trying work conditions, such as situations that require long hours, strenuous work, and physical stamina. You might work long night hours, early morning hours, hot and dusty days, freezing conditions, and any other variety. mathematical skills that include the ability or perform calculations based on weight and mass. According to Salary.com, heavy equipment operators can make a median annual salary of about $63,601. With a spread of about $55,311 to about $74,827, heavy equipment operators have a wide range of salary due to the part time versus full time availability of the positions. The lowest 10 percent of heavy equipment operators make about $29, 710 while the top 10 percent of heavy equipment operators can make about $81,640. This range varies on the type of tasks being performed, the equipment being used, and the certifications you have as an operator. Other reports state that heavy equipment operators made a median annual salary of about $45,040, which is about $8,000 more than the median annual wage for all occupations combined. The highest paid 10 percent of construction equipment operators are also reported to make $79,000. Obtaining you high school diploma or GED equivalency is a (most of the time) necessary first step in becoming a heavy machine operator. Although this is not a hard and fast rule, it’s a pre-req that will be necessary if you plan to continue your heavy machinery operation education at colleges and technical schools, and also might be a requirement to get into a union of construction association apprenticeship program. This is almost might be a requirement for vocational training. Ensure that you’ve thoroughly researched the requirements for your state and establishment you plan to work with. Do you need to have your high school diploma? Are you qualified and prepared for the demanding job you’re setting yourself up for? Do your research before you do anything else. It’s also to take time to research the job expectations and how they line up with your life an family goals — do long hours make sense for you goals and the life you see laid our for yourself? Do your research before you invest time, money, and effort into this career path. In the past, all you needed to enter the industry was to get hired on the spot and have some on-the-job-training, but the industry has adapted since then. Now, operators might need to attend college or technical school programs in order to become heavy machinery experts. If you’d like to spend months or years taking these courses, that’s fine and good, but if not, there are private heavy equipment operator training schools that are a widely accepted alternative. Some states require different licenses and certificates in order to become a heavy machine operator. For example, some might need you to posses a valid commercial driver’s license while others might need you to hold special crane licenses. Some states might require that you have a specific license to operate backhoes, dozers, and loaders, while others don’t require any experience or specialized license at all. What Education Do You Need to Become a Heavy Machine Operator? In the past, a simple high school degree and willingness to learn on the job could have landed you a successful positions as a heavy machine operator, but now, things are a bit different. The industry encourages, but doesn’t always require, a GED or high school diploma, as well as community college, college, or technical college course completion in heavy machinery courses. Vocational courses as well as privately-owned heavy equipment operator schools are highly encouraged as well. The offerings, course structure, and lengths of each program will vary from school to school, some only taking a few weeks to complete and others taking up to a year to complete. In these courses, you’ll learn hands-on training for common types of equipment, learn the education curriculum necessary to become a heavy machine operator, and learn what’s required to pass any certification exams you might need. Program costs will range depending on what type of program and where you plan to attend. It’s likely that these programs will range anywhere from hundreds of dollars to thousands of dollars. Again, if not interested in spending nearly a year in programs, you can enroll in privately-owned heavy equipment operator training schools as an alternative. These types of schools can be found throughout the United States. One of the best examples of this is the Heavy Equipment Colleges of America which operates on 8 different campuses. Many offer three week programs in heavy equipment operation and include things like classroom study, in-the-field learning, and hands-on training. What Certifications Do You Need to Become a Heavy Machine Operator? The certification requirements will vary from state to state. For example, some states will only require a commercial drivers license, while other states will require a special license for specific vehicles such as backhoes, dozers, and loaders. Several other states will require that you have heavy equipment professional certifications from places like the National Association of Heavy Equipment training Services as well as the National Commission for the Certification of Crane Operators. CCO certifications are offered for several different types of heavy equipment, including things like boom trucks, pile driver operators, tower crane operators, and more. Certifications typically last about 5 years each and must be renewed by passing a re certification exam and having about 1,000 hours of heavy machinery experience. Heavy machine operators are also required to pass substance tests that adhere to NCCCO substance abuse, ethical, and medical guidelines. The average training program duration will range anywhere from 3 weeks (if you choose to take on a privately-owned training course) to about a year if you enroll and invest in a vocational or community college education. This will vary from state to state and from jurisdiction to jurisdiction. What is the Job Outlook for Heavy Machine Operators? According to the Bureau of Labor Statistics, the overall employment of construction equipment operators is projected to grow by about 12 percent from 2016 to 2026. This employment growth is considered incredibly fast compared the average of occupations, and can be credited to the projected increase in spending infrastructure. Employment opportunities will be best available in urban, metropolitan areas where large commercial industries are centralized. That's a higher than average projected growth of 52,700 jobs. Should You Become a Heavy Machine Operator? Overall, the satisfaction that goes hand-in-hand with this career is high scoring. It has its general perks — good pay, job availability, and a constant demand for more and better heavy machine operators. That being said, it has its downsides, too. Heavy machine operators must be prepared to work long, seasonal hours that start early in the morning and reach well into the night. You will often be working the most extreme conditions — whether you’re experience hot dusty days or cold, freezing, snowy nights, the work never stops (unless it’s incredibly dangerous). The job is rarely glamorous and the responsibilities and duties are enormous. There also can be some difficulty finding a full-time job when there’s so much part-time employment in this field. But in general, this is listed as a career with a high satisfaction rating. According to research from Payscale.com, it was found that of 600 heavy machine operators interviewed, 4 out of 5 workers were high satisfied with their jobs despite laboring and demanding hours. The average median salary for a heavy machine operator is about $63,000, with a range of $55,000 to about $74,800. The job growth outlook is high, with BLS reporting that from 2016 to 2026, this industry will boom by about 12 percent. The education duration could take anywhere from a few weeks of vocational or private training to a few years of college education. Q. How Much Does it Cost to Become a Heavy Equipment Operator? It can cost anywhere from $4,000 to about $15,000 depending on the program you’re enrolling in or the apprenticeship you’re hoping to land. Q. How Much Does a Heavy Equipment Operator Make a Year? There’s a reported median salary of about $63,000 for heavy machine operators. Q. What Education Do You Need? This will vary. Some states and jurisdictions will require nothing more than a high school education, others will require college courses completed or vocational training completed. Q. Do You Need a Special License? Some jurisdictions require nothing more than a valid commercial drivers’ license. Others will require specific licenses through specific agencies. Q. What Do You Do as a Heavy Equipment Operator? As an operator, you will be in charge of accomplishing set tasks with your machine, keeping it clean, reporting big issues, fixing minor problems, and keeping the crew, and yourself, safe. My state actually requires a special license for vehicles like dozers but I don’t have that. I actually have the passion for the job, have taken a machinery course and have a GED but it’s frustrating to know that I have to still go acquire a license before I can land any apprenticeship. Yup. It’s very difficult finding a full-time job when there’s so much part-time employment in this field. So if you’re out to have it full time, I think you should reconsider. But be rest assured that the job has its general perks and this should keep you going. Hmmmmm. Working in extreme conditions? hot dusty days or cold, freezing, snowy nights, the work never stops?! I’m beginning to have a rethink. Truly the job is rarely glamorous and the responsibilities and duties seem just too enormous. Yeah, taking classes for this is really expensive. When I applied for a program in the field, I spent close to $12,000 but I don’t regret that. In all, the career has a high satisfaction rating and you’ll get your money back before long. Well, to be honest, the job isn’t that easy but it’s great for those who have a passion for it. As an operator, you’re the one in charge of accomplishing set tasks with your machine, keeping it clean, reporting big issues, fixing minor problems, and keeping the crew, and yourself safe. This I must say is hard work but you’ll definitely enjoy it if you are into it.